Right now 41 wild horses from the Reno area including Rambo’s band are at the Fallon Auction where kill buyers come to buy horses for slaughter. Advocates and concerned citizens are hoping to save these iconic mustangs from being sold into the slaughter pipeline. We have been in touch with Shannon Windle, President of the Hidden Valley Wild Horse Protection Fund who has arrived at the scene and is working on saving horses. She said there are a lot of horses. Contact Governor Sandoval to tell him you don’t want native wild horses sold at auctions where kill buyers shop. 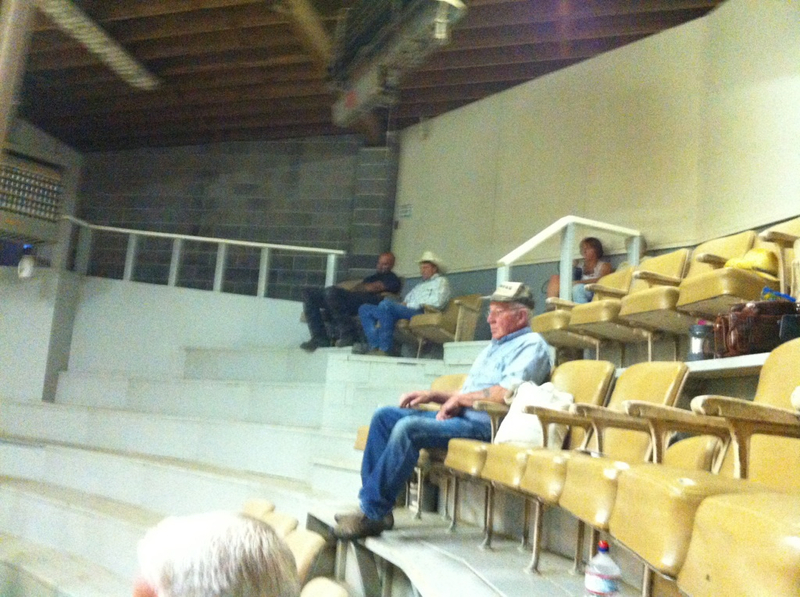 Ask him to give the horses to local advocacy groups rather than sell them into the slaughter pipeline. Tweet ©GOVSandoval Use #NEVADA to let the Governor. OAKLAND, Ca. (January 4, 2013)–Protect Mustangs, the Bay Area-based wild horse preservation group is organizing a peaceful protest during rush hour tonight outside the Rockridge BART Station (College Ave. in Oakland) from 5 p.m. to 6:30 p.m. Members of the public of all ages are gathering to show they want the cruelty & slaughter of indigenous wild horses to stop now. The preservation group recently learned of Nevada’s interest in opening a horse slaughterhouse to kill wild horses on tribal land near Reno. Many protests are being held in conjunction with the Carson City Protest, organized by the Wild Horse Preservation League, where the protestors are marching at midday to deliver Governor Sandoval letters from around the world asking him to stop the cruelty and let the advocates help the horses find homes or sanctuary. Other protests are being held such as the primary one in Carson City, one in Mill Valley tonight at The Depot Plaza sponsored by Wild horse Protection Act as well as protests held in Phoenix, on the East Coast, Europe and elsewhere. “American mustangs are so beautiful to watch living in freedom but now they are hard to find because there aren’t many left,” explains Hardrock who enjoys visiting the American West to take photos of wild horses. Sponsored by Protect Mustangs www.ProtectMustangs.org where you can find a lot of information on the wild horse crisis. Protect Mustangs is the California-based preservation group whose mission is to educate the public about the American wild horse, protect and research wild horses on the range and help those who have lost their freedom. Protect mustangs & Stop the cruelty! Make signs, bring friends and join the rally on Friday, January 4, 2012 (11 a.m. to 1 p.m.) in front of the Legislative Building (Hwy 395 East) in downtown Carson City, Nevada. If you can’t come to Nevada then hold a peaceful protest in your hometown and send us your photos. We will post them here. Even one person can have a protest. Well traveled roads with lots of traffic are great spots for small protests. Are you aware the federal officials discussed a plan to kill most of the native wild horses left in America? Read: Outrage over secret documents planning to kill or slaughter 50,000 native wild horses! Well, as you all know by now, we are battling the Nevada Department of Agriculture to get them to stop sending our Virginia Range Horses + horses from other areas as well – to auction: MEANING TO SLAUGHTER. So, we are having an emergency rally on Friday, January 4, 2012 (11 a.m. to 1 p.m.) in front of the Legislative Building (Hwy 395 East) in downtown Carson City. Sorry for the last minute notice. We have to have it before the next auction which is on January 9, 2013. NO TIME TO LOSE. We are calling it “Slaughter is not the Answer.” We will have flyers to pass out to press and others. Would appreciate your emailing me of how many people will be coming from your area and where you are coming from. Many of you have participated in demonstrations before. Please come at least 1/2 hour before the rally begins (in the park area next to the Legislative Building) so you can receive instructions (especially if you’ve never attended a demonstration before). There are certain regulations we must abide with. The Legislative police have always welcomed us wild horse advocates because we are polite and follow their directions. After the rally, we will be marching to the Governor’s Building (which is next door to the Legislative Building and close to where we gathered before the rally). Shannon Windle, President of Hidden Valley Wild Horse Protection Fund, will then bring hundreds of letters directly up to the Governor’s office – letters she has been gathering for some time opposing what NDA is doing with Nevada’s Treasures. You are welcome to make up signs and bring them with you. We have lots in our storage shed which will work and I’ll bring them as well. You are also welcome to bring your organizational signs. The easiest place to park is if you drive down Stewart Street. There’s usually plenty of parking directly behind the Legislative Building, which is convenient for carrying signs and tables to our setup area. Happy babies were saved thanks to the team effort. Saved from kill-buyers. Saved because you spread the word and donated. We are deeply grateful to everyone who helped. 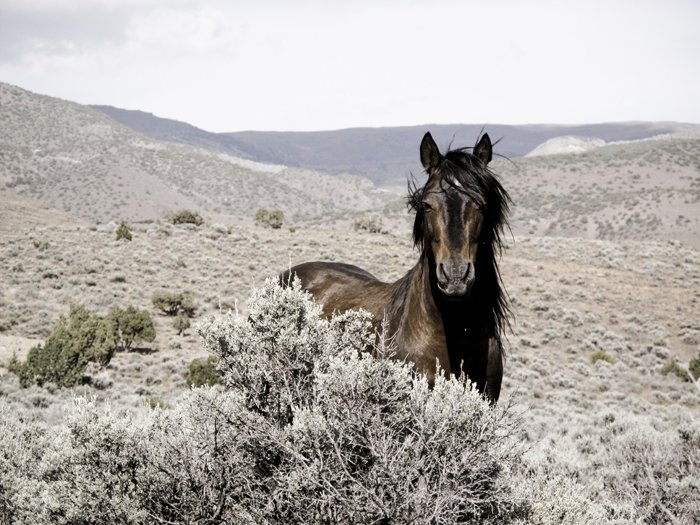 Call Governor Brian Sandoval and politely let him know you want the trapping and selling of Nevada’s indigenous wild horses at auctions frequented by “kill-buyers” to STOP now. 80% of Americans are against horse slaughter. Does he want Nevada to stay on the top of the bad list as perceived by Nevadans and everyone else? The first auction is this Wednesday in Fallon, N.V.–a town where he once lived. More than 22 Virginia Range wild horses from ‘The Meadow’, on the outskirts of Reno, are going to be sold by the pound. Kill-buyers will be bidding on America’s icons to sell them to slaughter for human consumption in foreign countries. Politely ask Governor Sandoval to step in–to stop the removals and the sales. Ask him to RELOCATE all the wild horses who have been trapped already by the Nevada Department of Agriculture (NDOA) and bring them food and water if needed on the range. 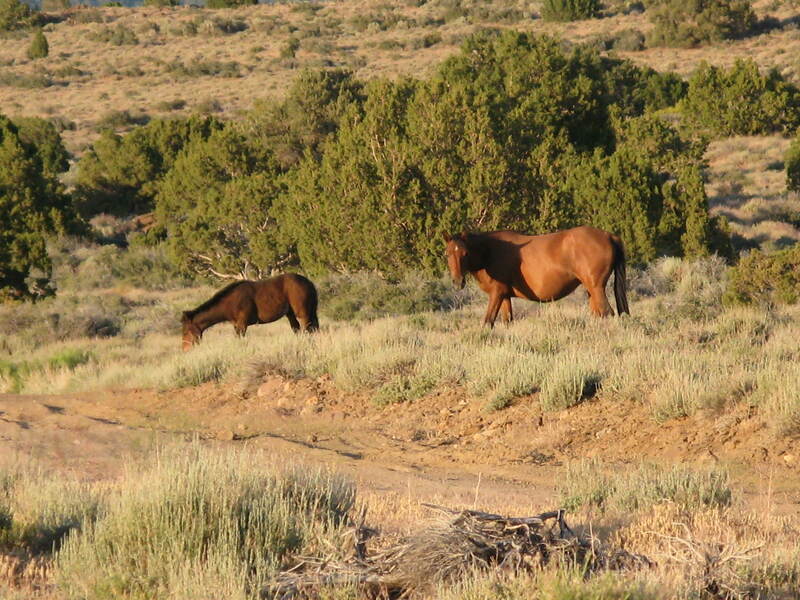 Rotten development planning and urban sprawl is removing habitat from wildlife–including wild horses. Not only is the sprawl causing global warming but now it’s causing strife in communities over wild horses. It’s the developers’ responsibility to fence out wildlife to prevent entry on their property if that is what they wish. Nevada is a “fence out” state by law. Back in August several wild horses were taken by people connected with a development. 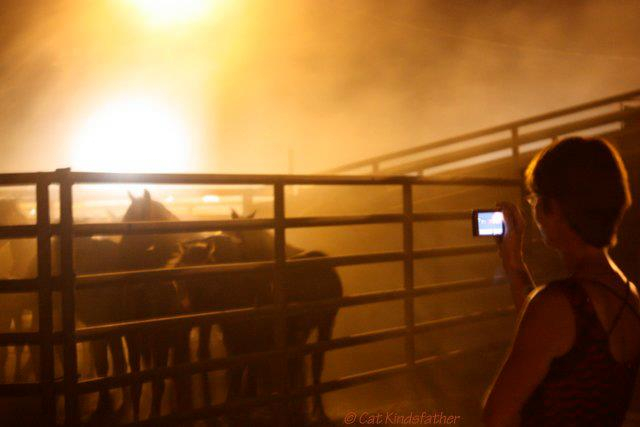 The horses ended up at the prison where they process wild horses to go to the auction frequented by kill-buyers. Who were these people and are charges being prosecuted against them? Are they connected to the current trappings at a development now conducted by the NDOA? Taxpayers should not pay for the NDOA to remove wild horses when the developer is not taking responsibility for putting up fencing. Nevada wants fiscal responsibility. Land development does not need to ruin indigenous wild horse habitat, break their families apart and sell them at auctions where kill-buyers purchase horses to sell to slaughter. We are asking for a win-win NOT for Nevada’s wild horses go to their brutal death–to slaughter. More wild horses are needed to stop Nevada’s mega-million dollar wildfires. According to a report by CoreLogic, U.S property exposed to wildfire is valued at $136 billion. If some wild horses do need to be brought in then the mustangs should NEVER be sold at an auction frequented by kill-buyers but should be cared for by the State of Nevada or given to sanctuaries and rescue groups. Their lives are the responsibility of the Silver State if they are not on Federal land managed by the Bureau of Land Management. We know Nevada can do the right thing. 80% of America’s population are against horse slaughter. If Governor Sandoval wants to run for President someday, then he needs to be aware that he is smearing himself by delaying taking action to stop the sale of Nevada’s beloved wild horses to kill-buyers. His character is being measured during this time of crisis. He has an opportunity now to make history and win the endearment of 80% of Americans nationwide. Emails can be sent via this link. 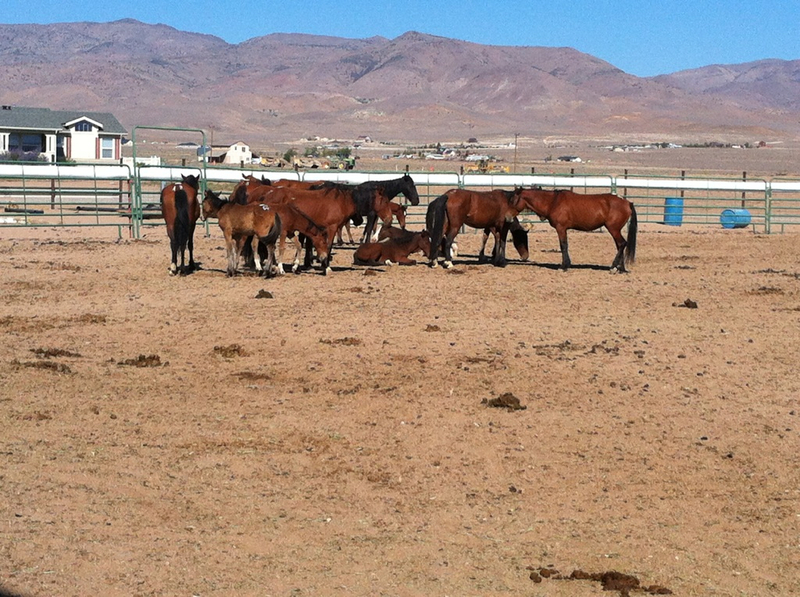 This photo shows several Virginia Range wild horse families at ‘The Meadow’ on the outskirts of Reno. These wild horses are loved around the world. Tourists enjoy observing them at ‘The Meadow’ and elsewhere. Eco-tourism businesses could boom taking customers on wild horse safaris. This would create jobs for Nevada. Now the Virginia Range wild horses are being trapped, castrated and ripped apart from their families only to be sold at a series of auctions, frequented by kill-buyers in Fallon, N.V. starting September 19th, 2012 and ending around October. 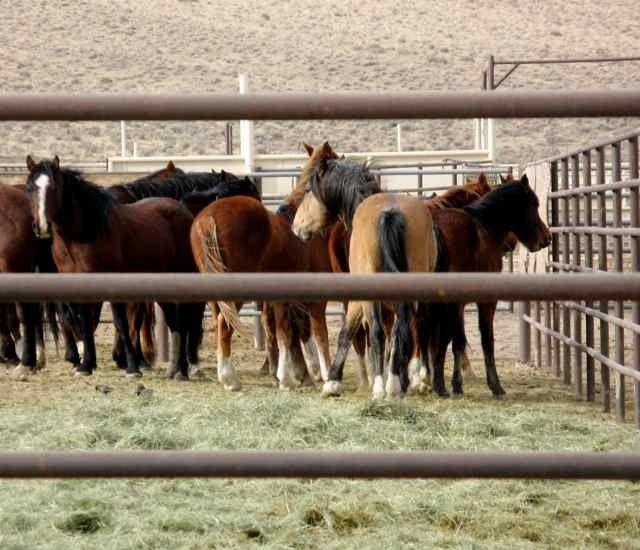 As of this date, the Nevada State Department of Agriculture has trapped more than 60 indigenous wild horses–of all ages–and is planning to dispose of them by selling them at the auction frequented by kill-buyers. Please contact Governor Sandoval and ask him to take this opportunity to make history. In Nevada, you can’t ask your neighbor to fence in his cows, you have to fence them out.